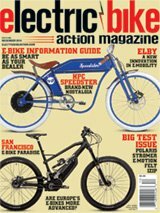 Look debuted their E-765 Optimum e-bike at the Sea Otter Classic. It's light and very impressive, hardly a difference from the 765. Within the next couple of years, electric motorcycles will take over the market.